In the very early stages of this blog, we received quite a bit of interest in our STUFF. People are really attached to theirs (we were too, not long ago). When discussing our lifestyle change, they always asked "what about your stuff?". The subject is so popular that it has evolved into it's own category in the blog, so you can simply click the Stuff button from the main blog page. Like most people in the U.S., we had a lot of stuff; hell, it was an embarrassing amount of stuff! It was to the point that Deb played the 30-day minimalism game three months in a row. Here's how it works: on the first day of the month, you take 1 item out of the house. On the second day, you take 2 items, and so on. It's all pretty easy until you're into the 3rd week, pulling 21 items, followed by 22, followed by, you know. And these can be little, like all those free pens you accumulated for decades but never use, or the jar of bent nails you've been saving in the garage for ??? One thing I remember tossing out was my appointment calendar from my last semester of college. At the time I thought it was so amazing that I could keep track of, and do all the things I had to do to in order to finish school (turning in papers, job interviews, tests, and of course parties). Little did I know, that was just training for adulthood where the number of scheduled appointments increased dramatically (but with significantly fewer parties!). But that silly appointment book was only good for 1 item in the game. 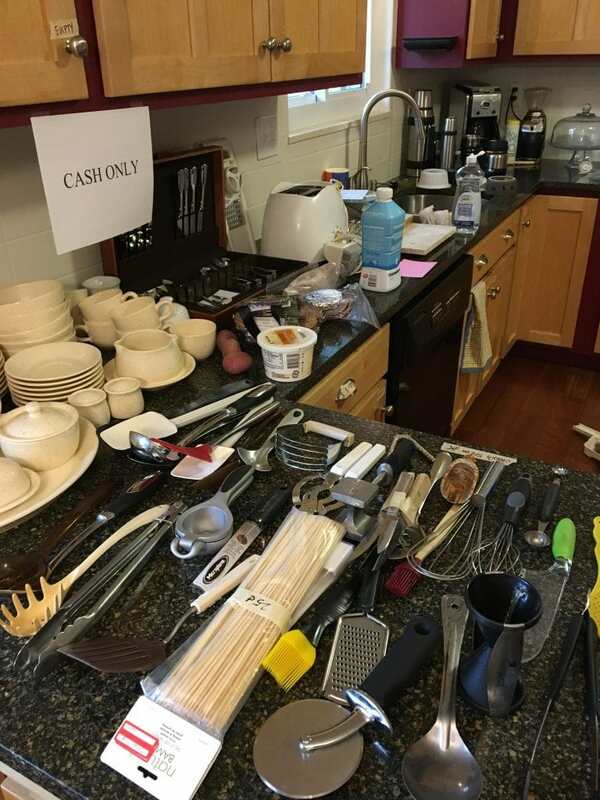 The result of the whole exercise is the removal of 465 items from the house in a month (or 496 if the month has 31 days). I consider it cheating if you choose February with it's mere 28 days (only 406 items!). But that was just the beginning of us getting rid of STUFF! We took about 35 years of accumulation (see the picture - this was just part of one room of our estate sale) down to 2 large duffels, 2 medium duffels, and 2 backpacks. Getting rid of all this STUFF was required for several reasons, most importantly to simplify our lives. But it was also required to be able to live the new life we wanted to live. It wasn't just desired, it was absolutely necessary. And it made sense financially too (storage and shipping costs are higher than just buying new stuff). 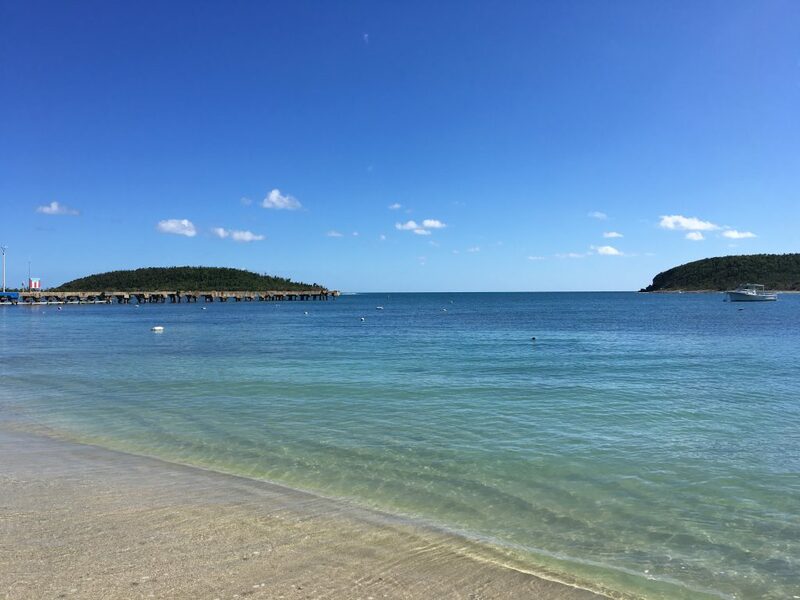 We did cheat a little, leaving a few things behind in Colorado (golf clubs, a small fire safe for important papers, some winter clothes, and some USPS shipping boxes with Mo' Stuff which we now have with us in Vieques). 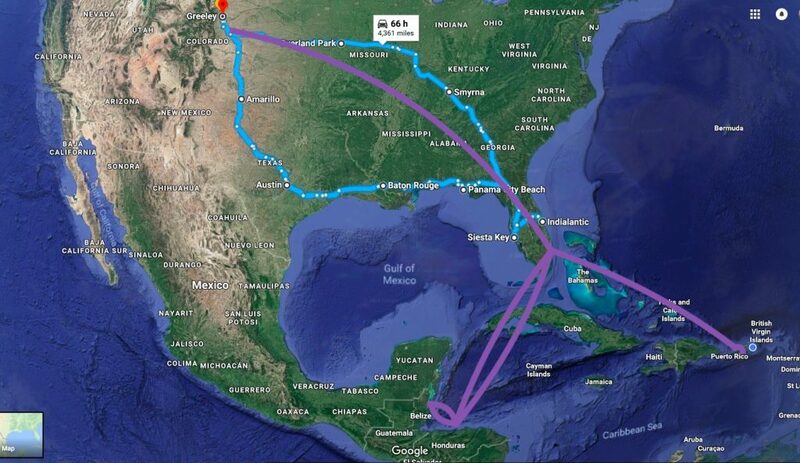 Once we lightened our load, we road-tripped it to Florida and lived there for several months, some on each coast. Then we ended up back in Colorado for a few important weeks with family before flying off to Utila and Roatán (both in the Bay Islands of Honduras), and Ambergris Caye (Belize). But once we finally got to our new island landing spot in Vieques, Puerto Rico we had to stock up on a few things. This wasn't just a few weeks any more, it was a real settling in. We're not great world travelers because we don't love the actual travel part. We like being places, enjoying places, but getting there is not half the fun, not to us! We're at best "functional" travelers - we can get there with our dogs and all our luggage, but probably a little worse for the wear. So yes, we've now acquired a few things. I wanted to talk about what items hold the most value for us now, a top ten list seems about right. It's certainly different from what we valued before. A couple of years before I retired, if you asked me what things I valued most (these are things, not family, pets, friends, etc.) I probably would have thought of stuff like my 2006 Acura TSX, my 55" TV w/Blu-ray player, my 47" TV w/Blu-ray player, stereo system, hot tub, my cushy recliner, gas fireplace, maybe the beer & wine fridges (really the contents! ), maybe my mountain bike. Deb couldn't really remember her faves, but I expect she would throw in her Cuisinart coffee maker, her 2005 Honda Element, and the beer garden we built and used so much in the summertime, along with the chimenea that kept us warm outside at night. She did love her bike and the crushed ice that came out of the fridge! Two years later, with all that travel and all those places in the rear view mirror, we'll still have some of the same types of things on the list, but often for different reasons. And we have several things that before, we'd never have even considered as being in the top ten on the list. The first one that comes to mind is our mosquito net. 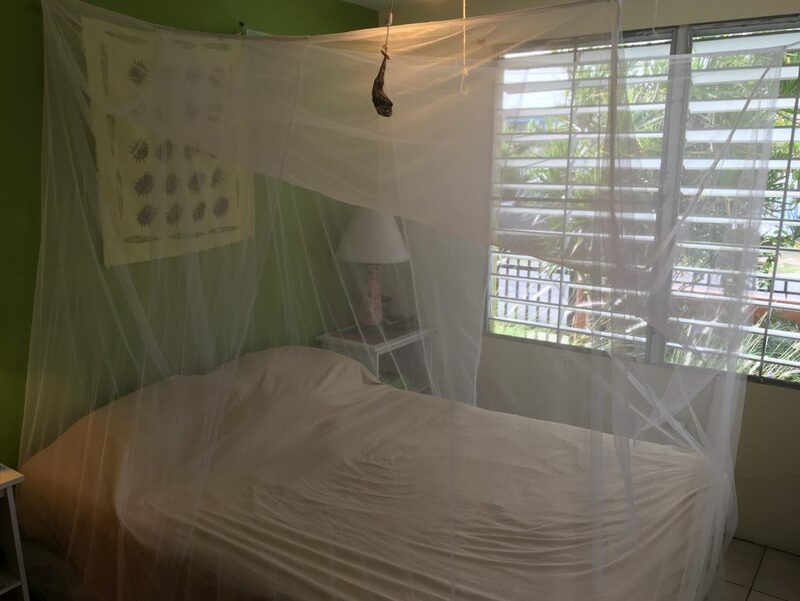 I say it all the time, "our mosquito net is the best thing we own". Why the big deal? Of course it's because we live in the tropics and there are mosquitos, but you'd think we could keep them out of one little room (our bedroom). You'd think, but we need the door open for air flow, and it only takes one mosquito to ruin your whole night. I speak from a bit too much experience on this. You end up with several bites before you're awake enough to realize it, and then you spend the rest of the night itching and sweating under the sheets, waiting to hear the buzz in your ear as they go for the only target left, your head. It's a recipe for a bad night's sleep and a lot of coffee in the morning. The mosquito net is simply the best thing we own! The coffee pot would be next, but because we lose power a lot here and our backup power system doesn't have the juice to run it, I'm nominating the stainless steel french press we use when there is no power. We heat water on the gas stove and enjoy a cup of Joe, with or without electricity. Macbook Air & iPad - we enjoy these tech devices quite a bit because they serve so many purposes. Communication with friends and family (incl. this blog) is probably the biggest benefit. But they are also our entertainment hubs. We don't have a TV so we use them to play music, or watch Netflix and other streaming shows, live sports, etc. 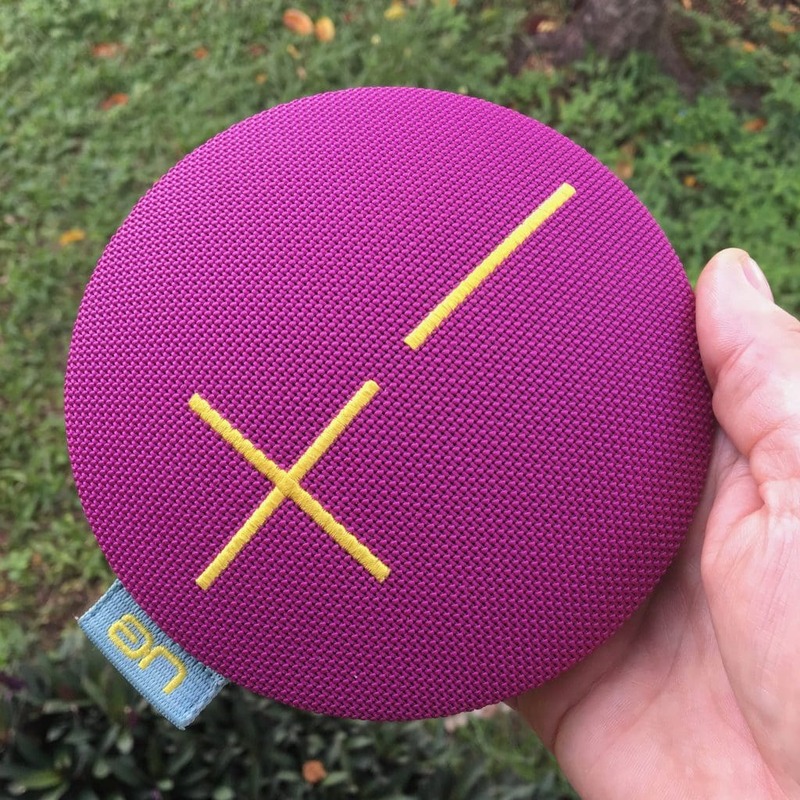 Our bluetooth speaker is on this list as well - we play music on it all the time, like our Retirement First Anniversary Playlist, which you can find here (it's better than that sounds). The speaker is waterproof and although we seem to forget it every time we go, it's the perfect beach accessory (if you remember to bring your phone AND you have data coverage at the beach for Pandora). Our bikes had to be on this list. They gave us the ability to explore much of the island, and get a LOT of things done in the early days here, pre-automobile. We ran our share of errands in town, went to beaches, got chased by a bunch of different dogs, and got our exercise with the bikes. We even hauled home the solar system batteries, one at a time, strapped to the rack on the back of my bike. But the bikes have limitations, mostly around safety. Nighttime riding is very dangerous, as are a few key roads at any time of day or night. They are very narrow, hilly and winding, and full of potholes. While drivers are dodging the potholes and each other, they might not see the bike around the next bend. So we got a car after not having owned one in over 6 months. It's known around here as an "island beater" and there are lots of them. It's a 2003 Suzuki Vitara with a bunch of miles on it, but also with a rebuilt engine that's tight, no leaks. It's got some scratches, the paint isn't perfect, and the right rear inside door handle is gone. We gave a guy a ride home one night from the bar and when he couldn't get out he asked us if it was a cop car! But it's perfect for us because it hauls us to any part of the island we want to go. 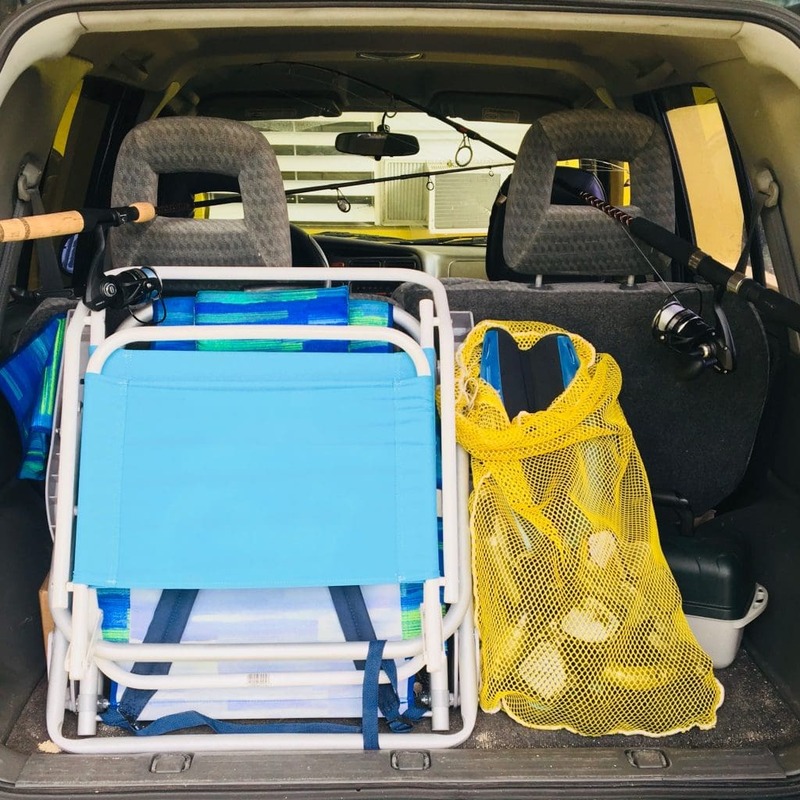 And it hauls beach chairs, fishing gear, snorkel gear, all the good stuff. It allows us to truly "do it right" on this island. Speaking of beach chairs, we use them at least twice a week every week. Because of that, they've become must-haves for us. Snorkeling gear is key too. I bought a mask with vision correction in the glass from Amazon. I have astigmatism, which is somewhat difficult and fairly expensive to correct in a swim mask, so I just got the optical power corrected instead of the full prescription. I paid something like $50 for the mask and it's worth every penny - the vision is shockingly good. After having gone decades snorkeling with bad vision, this thing is a marvel. It's so nice to be able to really see under water! 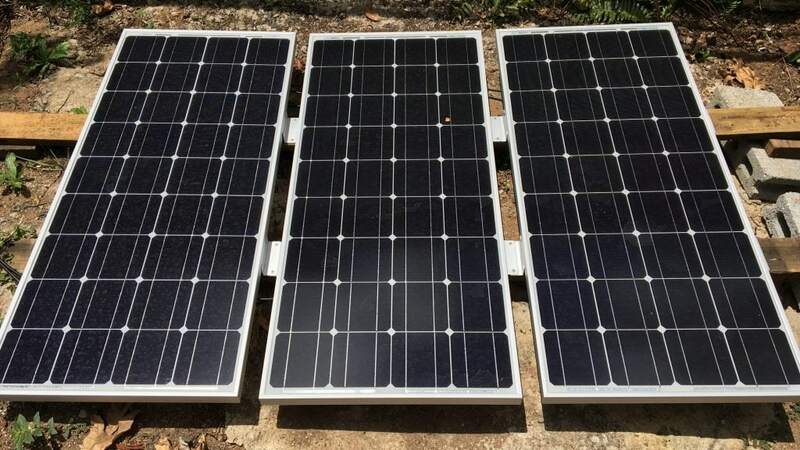 Our solar backup power system has received a lot of press on this blog, and rightfully so. It was expensive but it brings real positives for us. The obvious one is that when the lights go out, we can turn them back on. And it gives us a fan, and internet, and the ability to charge all our devices, including that bluetooth speaker. It also allowed the engineer hiding in the deep recesses of my brain to have some fun putting it together, learning about what's important and what's not, and generally just geeking out on the technology. 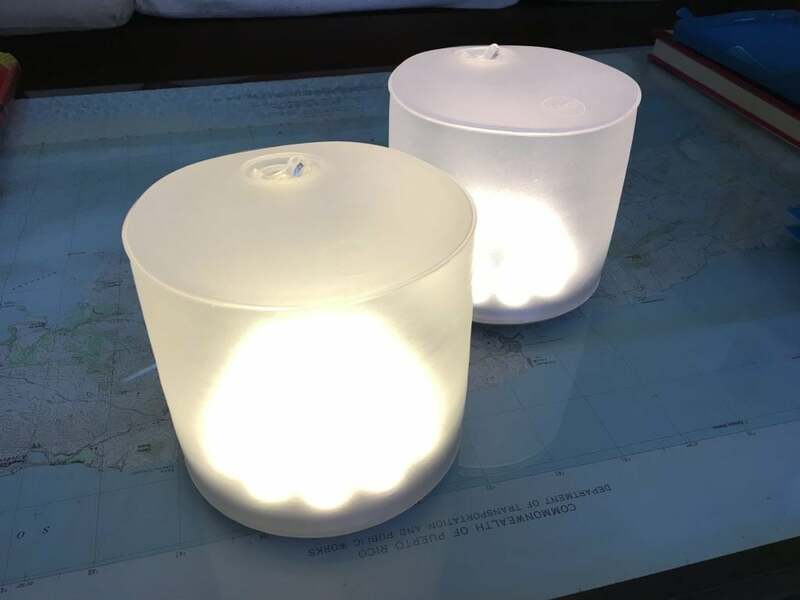 Before we got the solar stuff, we bought these great solar lights called Luci lights. They inflate into broad cylinders which you turn panel side up out in the sun during the day, and then flip over for use as a light at night. They are simple, stylish, work very well, and hold their charge for a long time when not needed. Because our bathroom has no power outlets, we use one of them as a nightlight in there every night. Is that 10 things? I think so. Now what's changed in the last couple of years? Although we do have a car, it's a clear step down from our 2 sweet Colorado rides, but we love it still. There's no 55" TV, or any TV at all. We may get one some day to give us a larger screen (maybe 22"?) and a better viewing angle than a laptop to watch Netflix and other streaming media, but I can't imagine paying for cable TV again (it would only be satellite TV here). Deb says if we get a TV you will know I put up a good fight because she doesn't want one! 🙂 There's no stereo system, we have our little speaker for that! There's no hot tub, chimenea, or gas fireplace - none of those things we needed to keep warm back in Colorado! I guess the beer & wine fridges fall in that category as well since they provided the spirits to keep us warm on the inside. 🙂 We live a much simpler life than we did before, and we like it better, much better. We have fewer creature comforts, but we're certainly comfortable creatures. But all of this is just a lot of mental gymnastics, isn't it? Why even bother taking stock of your favorite stuff? There're a couple of reasons behind it. First, it makes clear that many of those things we chased before aren't really important to us now, validating the decisions we made in the last couple of years (and not in a superficial way). And, as we look ahead in our lives, it makes clear what's really important to us now. Of course, our family and friends (old and new) top the list of what's important, and our little doggies are close behind. But stuff-related, based on this top ten list, it seems that most important is a good night's sleep 🙂 , coffee in the morning, communication with the world, music, the ability to explore our island, and having lights and a fan in the house. That's pretty much it, and we like it that way. Oh yeah beaches, those are big frickin' deals to us as well! How about you, Kneedeepers? What are the best things you own and why? Do they give you comfort, make you laugh, let you relax or get you excited? Let us know in comments below! TODAY'S SPECIAL: "Happy People" by Little Big Town, whatever makes you happy people! Haha, yes it’s a good one! I do enjoy that car, daily. But I also like riding my bike to meet Matthew and the gang after work! It’s great to have both, yay! Wonderfull *stuff*, Norm :-)… At the top of my list (well, close to beer :-).. would be.. MY HEALTH..
(ftfy) And yes, I agree. You’re getting into gratitude now, which I’m grateful for. 🙂 I could do an entire blog post on gratitude, and may well do that one day. Thanks! Norm – I see nothing wrong with your priorities. That mosquito net keeps you healthy. And coffee – that’s important! Your “stuff” should be a statement about what you are, and what you intend to do. Long ago, I took an Engineering Economics course that talked about the cost of capital for production. Your current project is “retirement”, and you have acquired the required capital to complete the project. The “30 day minimalism game” is a bit too aggressive for my taste; I would have surrendered the college appointment calendar one page at a time. I didn’t need one of those for my last semester – you did, and that’s probably why you made manager. I also have a bike (because cardio stuff), and a few other items that shall not be named. Speaking of craft beer, I’m a home brewer. I could list the 8 taps, but that would be bragging. Feel free to invite yourself to Man Cave Brewery – just call ahead to be sure someone answers the door. Home brew sounds great Perry! I used to brew as well, and may take it up again one day, but that’ll take some stuff!